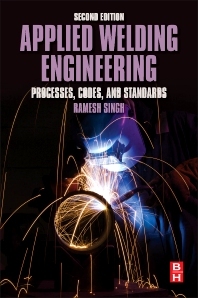 A practical and in-depth guide to materials selection, welding techniques, and procedures, Applied Welding Engineering: Processes, Codes and Standards, provides expert advice for complying with international codes as well as working them into "day to day" design, construction and inspection activities. New content in this edition covers the standards and codes of the Canadian Welding Society, and the DNV standards in addition to updates to existing coverage of the American Welding Society, American Society of Mechanical Engineers, The Welding Institute (UK). The book’s four part treatment starts with a clear and rigorous exposition of the science of metallurgy including but not limited to: Alloys, Physical Metallurgy, Structure of Materials, Non-Ferrous Materials, Mechanical Properties and Testing of Metals and Heal Treatment of Steels. This is followed by applications: Welding Metallurgy & Welding Processes, Nondestructive Testing, and Codes and Standards. Case studies are included in the book to provide a bridge between theory and the real world of welding engineering. Other topics addressed include: Mechanical Properties and Testing of Metals, Heat Treatment of Steels, Effect of Heat on Material During Welding, Stresses, Shrinkage and Distortion in Welding, Welding, Corrosion Resistant Alloys-Stainless Steel, Welding Defects and Inspection, Codes, Specifications and Standards. Ramesh Singh, MS, IEng, MWeldI, is registered as Incorporated Engineer with British Engineering Council UK and a Member of The Welding Institute, UK. He worked as engineer for various operating and EPC organizations in Middle East, Canada and US. Most recently, he worked for 10 years with Gulf Interstate Engineering, Houston, TX. He is now consulting in the fields of pipeline integrity and related materials and corrosion topics. Ramesh is a graduate from Indian Air Force Technical Academy, with diplomas in Structural Fabrication Engineering and Welding Technology. He has been member and officer of the Canadian Standard Association and NACE and serves on several technical committees. He has worked in industries spanning over aeronautical, alloy steel castings, fabrication, machining, welding engineering, petrochemical, and oil and gas. He has written several technical papers and published articles in leading industry magazines, addressing the practical aspects of welding, construction and corrosion issues relating to structures, equipment and pipelines. Senior Principal Engineer (Materials, Welding and Corrosion) for Gulf Interstate Engineering and Consultant, management of welding, materials, and corrosion, Nadoi Management, Inc.